I’ve learned a few things in doing this blog based on large lists of films. One of the things you learn quickly is that when you locate a film that’s been difficult to find, the best thing to do is watch it as quickly as you can. Frequent commenter Joel posted a link to White Banners the other day, and while I had plans to start my 2017 Oscar films today, I knew that I’d have to change those plans. It turns out that the same website has a couple other difficult-to-find films, so I’ll likely be hitting those soon enough. Before I jump into the movie, it’s worth talking about a little bit of Oscar history here. It’s not often that you encounter a movie that changed the way that Oscars are nominated and voted on, but White Banners is such a movie. Fay Bainter was nominated for Best Actress for this role, and was simultaneously nominated for Supporting Actress for Jezebel, which she won. I’m not entirely sure how the rules were changed—I’m going off what IMDB tells me here on Bainter’s trivia page (if you know, please—use the comments below). It’s also worth noting that it was Bainter who handed Hattie McDaniel her Oscar the next year. One of the things I find fascinating about films from this era is what is more or less considered normal for people. The Ward family who will take center stage of the ups and downs of life in White Banners are poor. Do you know how we know they are poor? They don’t have any servants. I’m continually struck by this. The “average” family in so many films of this era have help. It would seem to me, though, that this would mean that the help is a sizable percentage of the population, and are thus…not normal? I’m not sure. I can’t help but think that in 1938 as well as through most of the Great Depression that most people didn’t have help, and yet this seems to be the norm for Hollywood. It’s not too different from what I mentioned with I, Daniel Blake about a week ago. American depictions of poverty are often really depictions of what many would consider roughly middle class. That appears to be the case here. Anyway, Paul Ward (Claude Rains) is a chemistry teacher who spends his nights trying to invent something (anything!) to improve the family fortunes. 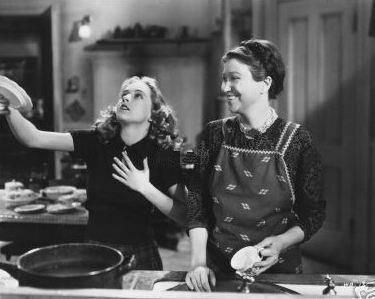 Wife Marcia (Kay Johnson) is tired and not quite recovered from the birth of their young child, while daughter Sally (Bonita Granville) constantly chides her father for being mean to Peter Trimble (Jackie Cooper), a boy on whom she has a significant crush. The world of the Wards changes greatly one day when a homeless woman selling apple peelers appears at the back door. The woman in question is Hannah (Fay Bainter), who soon insinuates herself into the life of the Wards, more or less working for room and board. Really, what she tells Marcia Ward is that she’ll save the family money on groceries and other items, and she’ll pay herself out of the savings she creates. Honestly, getting room and board in the height of the Great Depression was probably a pretty good deal in and of itself. Anyway, Hannah soon proves herself to be a fine cook and extremely shrewd. What will follow will be a high point, a very deep low point, and a concluding high point with some solid melodrama and Dickensian coincidences tossed in. Paul Ward is told to take Peter Trimble under his wing. The two set about inventing the refrigerator (yes, really. That’s the plot), but the idea is stolen and patented by some local businessmen thanks to Peter’s clumsiness. The loss of his invention is coupled with the sudden serious illness of Sally, putting the Wards into a very deep hole. Leave it to Hannah and her grand philosophy of life to get the family out of it and get Paul Ward in particular back on his inventing feet. All of this is well and good, but that’s not all we’re going to get with White Banners. No, we’re going to have some melodrama shoehorned in with our morality of turning the other cheek. See, there’s a connection between Hannah and some people in town, and before we’re all done, that’s going to be brought into the open and we’re going to have some conversation and tears about it. Yes, I’m being a bit dismissive here, but it’s not easy to take White Banners that seriously in terms of its plot. This is drippy stuff, the sort of thing that makes one long for the sane, hard-hitting ideas of Frank Capra. The cast is a good one, though. It’s difficult to go wrong with Claude Rains in general, and despite the formula and the clear attempt to shoot for some tears and extra drama, Fay Bainter is quite good as an actress. What this means is that White Banners is less than the sum of its parts. I love Claude Rains; I like Fay Bainter, but I don’t love the movie itself. I don’t hate it, either, but I don’t love it. The main reason I don’t is that the philosophy it seems to espouse is one that, bluntly, would get anyone who followed it screwed 99 times out of 100. Why to watch White Banners: It’s rather sweet in spite of itself. Why not to watch: It’s sometimes more twee than sweet. I'm glad you were able to check it off your list but I felt pretty much the same way. Happy to have seen it, I think it was during TCM's Summer Under the Stars for Rains though it might have been an Oscar month but it was only shown the once as far as I know, but I have no desire to revisit it despite the cast. The story really is run of the mill, what amazed me was that it received a nomination for Best Foreign Film at the Venice Film Festival that year!-why?, and while Fay Bainter was her usual terrific self she won for the right performance as Aunt Belle in Jezebel which gave her more to work with. Yeah, this was a check in a box, ultimately. It's got a great cast, but the story itself isn't much to look at.